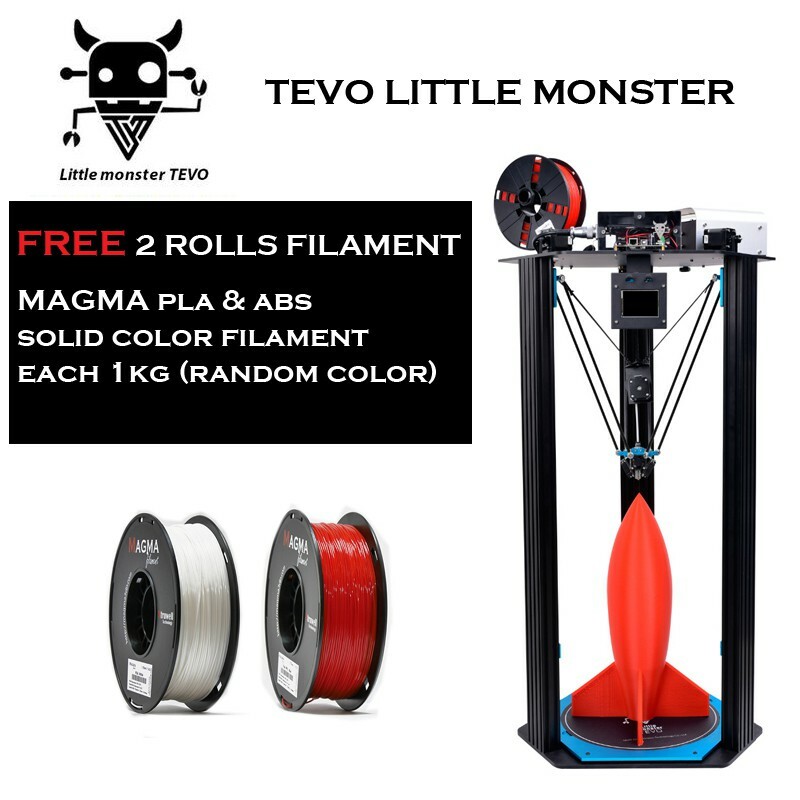 The first Little Monster Delta 3D Printer by TEVO with large build size D340x 500mm featuring glass-ceramic heated build plate, dual stainless steal fan shrouds for effective cooling, Openbuilds Aluminium Extrusion 4080, Full CNC Structure, Titan Extruder and Auto-calibration with ANTCLABS BLTouch. This is a Complete DIY Kit (Unassembled) – Everything is included to assemble this kit, you can start printing when you have completed assembly and adjustments. You are responsible for assembly and as such we cannot accept returns for this Kit once opened and assembled as we have no control over what you may do to the components of the kit or your assembly technique. While this kit is easy to assemble you do need a little understanding of electrical wiring and a healthy respect for electricity. You need to understand and use proper wiring and mechanical assembly techniques with this kit. Heating plate temperature: 60-120°C (when in a 25°C environment – no drafts) AC powered for faster heating. P&P, do not need to modify your firmware, support MarlinSmoothieware and Repetier. Designed to support non-Cartesian machines (rotational axes : wall drawer, SCARA robot, Delta/Parallel robot, Robotic arm, Spherical/Cylindrical robot,etc.). Currently supported : Cartesian and H-Bot ( CoreXY ), Linear Delta, Rotary Delta and Feather. Compatible with the normal Reprap ecosystem (G-code flavour), making it compatible with the common Reprap Hosts ( Pronterface, Octoprint etc ). ABS (Acrylonitrile-Butadiene Styrene) is a type of thermoplastic commonly used in 3D Printing. It is also widely used in different industries such as electronics, automobiles, environmental protection equipment and etc. ABS is well known for its performance in terms of toughness, impact- resistant, chemical and heat resistance. ABS requires a heated bed when printing and also, need to ensure that the heated bed is properly level, clean and oil free. We recommend that ABS filaments should be used in a well- ventilated area. You can apply acetone on your final ABS product to achieve glossy appearance.